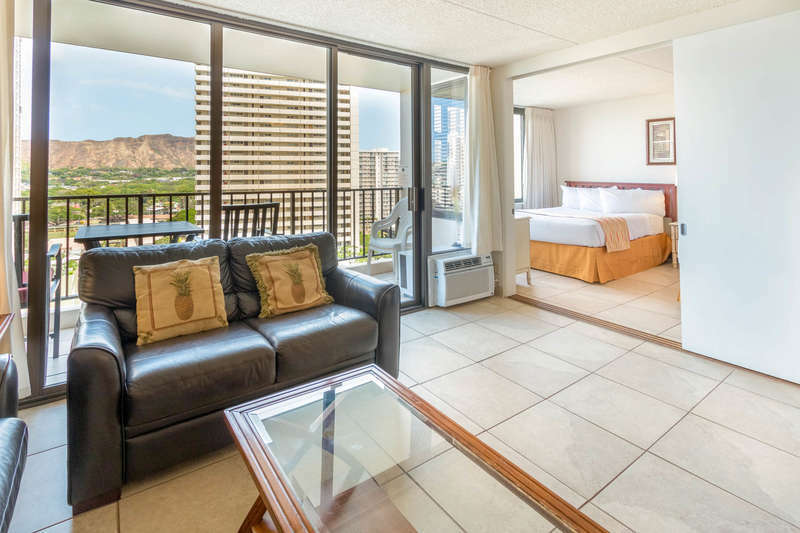 Soak in gorgeous views of Diamond Head and the ocean, while enjoying all the comforts of home in this wonderful corner condo suite. 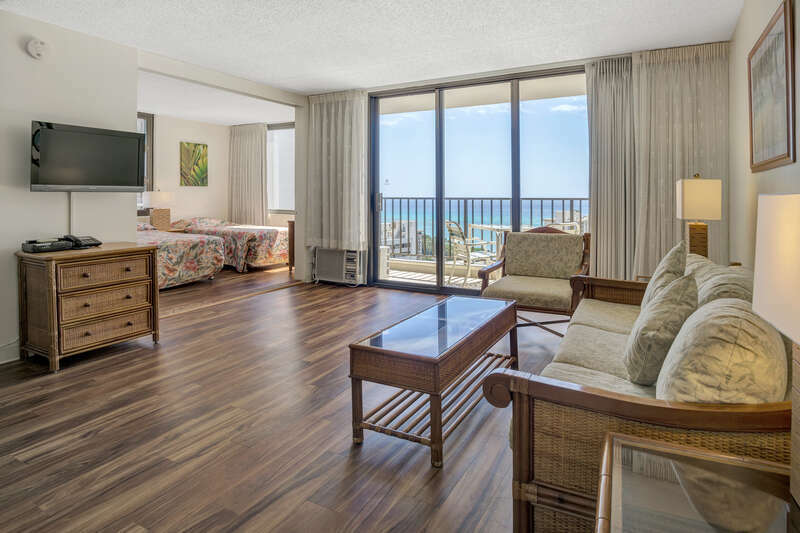 Corner condos are the largest size suites available in the Waikiki Banyan! It is tiled throughout - clean and sanitary. Sit outside and relax on the lanai or just enjoy the view. 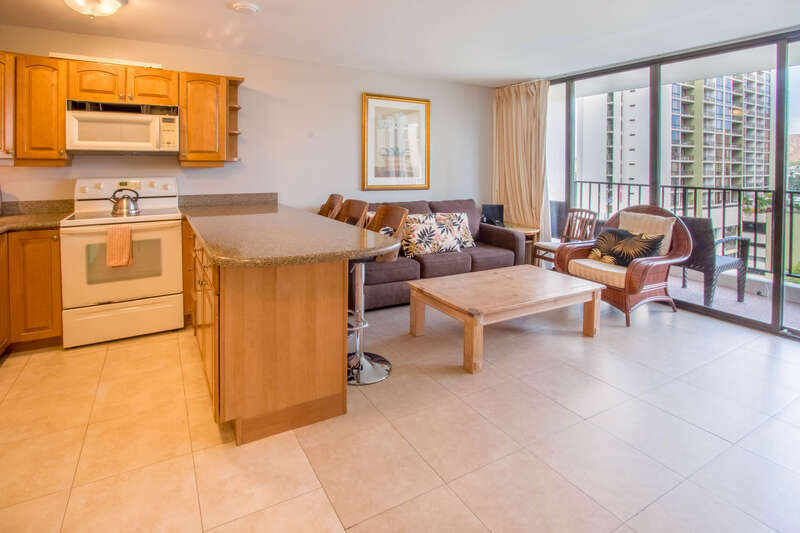 World famous Waikiki Beach is just a block away! Enjoy a fully equipped kitchen and comfortable seating in the living room. Kitchen has stainless steel appliances, updated cabinetry, colorful backsplash, and extra counter space. Fully stocked kitchen includes refrigerator, range, microwave, rice maker, coffee maker, and other kitchen wares. There is a dining room table with seating for four people. Sleeping arrangements include a King-sized bed in the bedroom and a sofa-bed in the living room. High quality air mattresses are available for rent should you require additional sleeping capacity. The bathroom has upgraded cabinetry and tile with plenty of storage. Step into the glass doors into a modern shower. The hand shower has 5 spray patterns for your comfort after a day of fun exploring!